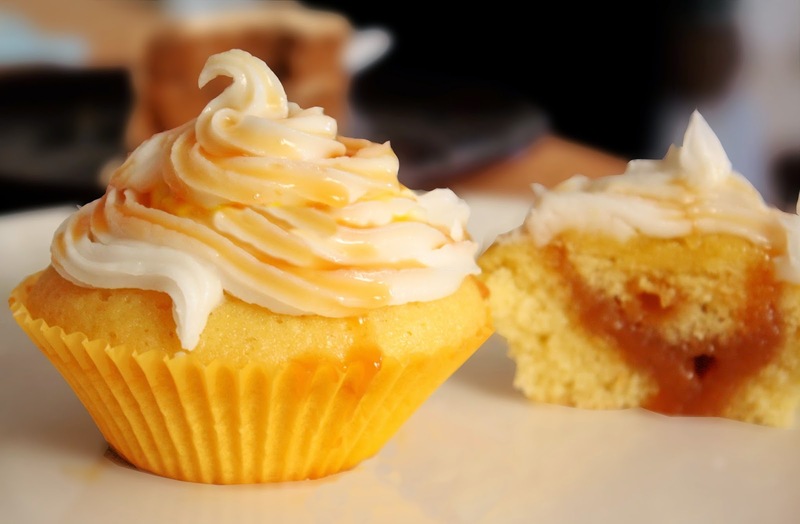 Cupcakes filled with homemade butterscotch sauce, topped with vanilla frosting and caramel syrup. First sieve together all purpose flour and baking powder. In other bowl, Break eggs and whip it. And sieve it. In other bowl, melt butter to room temperature, and the add a cup of sugar and mix well. To this bowl add eggs step by step and mix it. Add 2 drops of vanilla essence. Then add the flour mix to this spoon by spoon, keep on mixing while doing this. Preheat oven to 350 degree centigrade. Pour the cake mixture into cupcake cups 2/3rd filled and the place it in oven. Tooth pick inserted at the center of the cake should come out clean, then the cake is done. Melt 1/4 cup of butter in a pan, then add powdered dark brown cane sugar. When it melts, add heavy cream, salt and essence and boil till it bubbles and thickens little bit. Turn of the stove and let it cool. When everything is done, take each cupcakes, scoop the cupcake on the top in the center. Fill in the butterscotch filling. Place the scooped out piece of cupcake back on it. 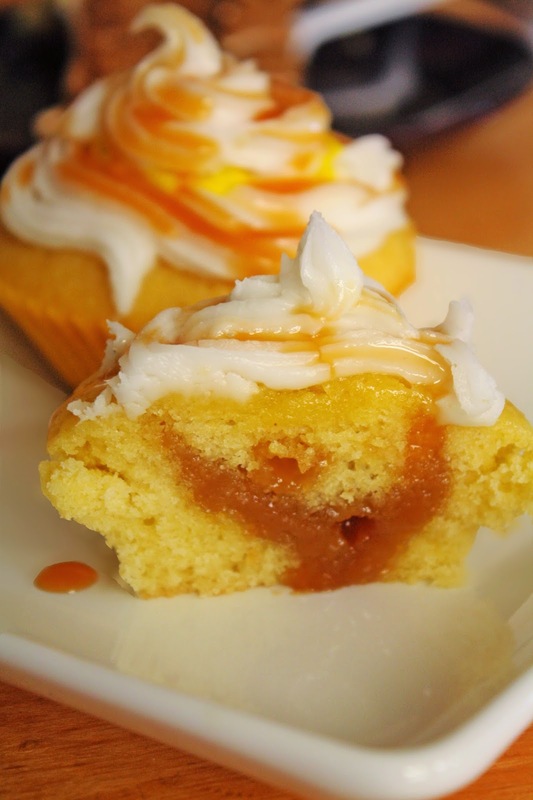 Decorate with the icing and caramel syrup or butterscotch filling.